Sheung Wan (Chinese: 上環) is an area in Hong Kong, located in the north-west of Hong Kong Island, between Central and Sai Ying Pun. Administratively, it is part of the Central and Western District. 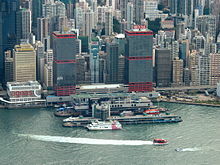 The name can be variously interpreted as Upper District (occupying relatively high ground compared to Central and Wan Chai), or Gateway District (perhaps a reference to the location where the British first entered and occupied Hong Kong). Sheung Wan was one of the earliest settled places by the British, and belonged to the historical Victoria City. The site of the original occupation of Hong Kong Island by British forces in 1842 was at Possession Street, between Queen's Road Central and Hollywood Road. A plaque to this effect can be found in Hollywood Road Park at the top of Possession Street. The foot of Possession Street, Possession Point, was at that time on the shoreline, but is now several hundred yards inland due to reclamation. Sheung Wan is surrounded by Sai Ying Pun in the west, Central in the east, Victoria Harbour in the north and Victoria Peak in the south. Part of the Mid-Levels is located within Sheung Wan. The border between Central and Sheung Wan consists of the entire Castle Lane, the entire Aberdeen Street, the entire Wing Kut Street, the section of Des Voeux Road Central between Wing Kut Street and Wing Wo Street, the section of Wing Wo Street north of Des Voeux Road Central, the section of Connaught Road Central between Wing Wo Street and Rumsey Street, and the section of Rumsey Street from Connaught Road Central to the waterside. Garfield Mansion is in Sheung Wan while Green Field Court is in Central. The border's location south of Seymour Road in the Mid-Levels is unknown. The Sheung Wan Route is one part of Central and Western Heritage Trail designed by the Antiquities and Monuments Office and Leisure and Cultural Services Department. The route covers 35 historic buildings and sites in Sheung Wan. Cleverly Street (急庇利街). Named after Charles Saint George Cleverly, the 2nd Surveyor General of Hong Kong Government. Sheung Wan is served by the Sheung Wan Station, formerly the western terminus of the Island Line of the MTR metro system. Kennedy Town became the new terminus of the Island on December 28, 2014. 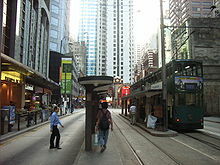 Trams also run through Sheung Wan, and one of the tram termini, Western Market, is located at the junction of Des Voeux Road Central and Morrison Street near its namesake. 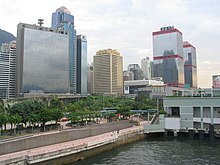 The Hong Kong-Macau Ferry Terminal in the Shun Tak Centre has ferries and helicopters to Macau and to several destinations in Mainland China. Numerous bus routes run through Sheung Wan. Central (Macau Ferry) Bus Terminus, located next to the Hong Kong-Macau Ferry Terminal, is one of the largest bus termini on Hong Kong Island. 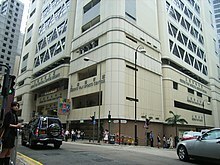 The head office of Wing On is in Wing On Centre [zh] (永安中心) in Sheung Wan. Due to the high French expatriate population, the French International School of Hong Kong previously operated a Kindergarten campus in Shops 2-4 on the ground floor of Tung Fai Gardens (東暉花園) in Sheung Wan. ^ Yanne, Andrew; Heller, Gillis (2009). Signs of a Colonial Era. Hong Kong University Press. p. 84. ISBN 978-962-209-944-9. ^ "Corporate Info." Wing On. Retrieved on 6 January 2019. "PRINCIPAL OFFICE 7th Floor, Wing On Centre 211 Des Voeux Road Central Hong Kong " - Chinese address: "總辦事處 香港德輔道中211號永安中心7樓"
^ "Campuses - Sheung Wan." French International School of Hong Kong. May 18, 2012. Retrieved on February 10, 2017. "Kindergarten (except RC) located at Shops 2-4, G/F, Tung Fai Gardens, 17 Po Yan street, Sheung Wan." 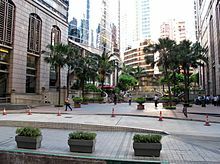 Wikimedia Commons has media related to Sheung Wan.